Freedom Youth Project Foundation develops training and education for Public Awareness, Prevention and Continuing Education of Professional who work with victims and at-risk populations. Development of training is managed and tracked in this section of Project Central which is separate from other "Projects." Overview of human trafficking for awareness of the issue, or high-level awareness of a subtopic of the issue. Educational seminar for target age youth (age 10 to 21) designed to teach the kinds of deception used to lure targeted victims into the world of trafficking. Developed for youth, foster youth, foster parents. English and bi-lingual versions. Leader Led Training provided by FYP for professionals working with victims and at-risk populations to provide understanding of the issue, who the victims are, how and why they are targeted, the trauma and challenges of providing services to victims. Developed for licensed and unlicensed staff at agencies, schools and organizations whose mission includes human trafficking. web-based training for professionals working with victims and at-risk populations to provide understanding of the issue, who the victims are, how and why they are targeted, the trauma and challenges of providing services to victims. Trainings are short 12 minute trainings, with quiz to track consumption and measure comprehension. 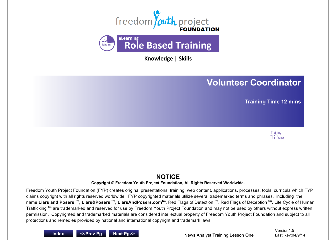 Designed for internal use at FYP to train staff, interns and volunteers to train specific areas of work at our agency.